Ullscarf again - 4 years later. Why? 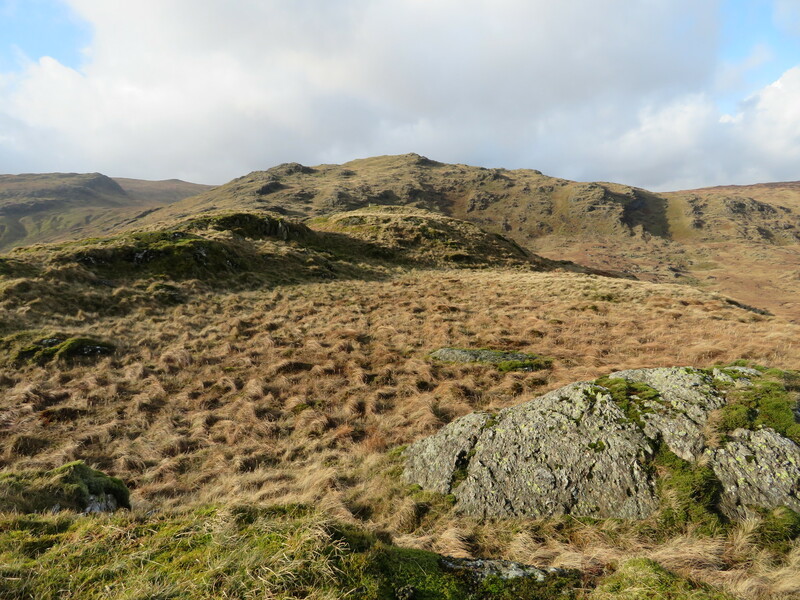 The Central Fells in which Ullscarf sits on arguably the wettest ridge and ground area of the whole of Lakeland once again has had the pleasure of my boots tramping and sinking steadily into its soft covering of peat and moss whilst intermittently working around the numerous pools and larger stretches of water that despite being the size of some of the smaller tarns remain unnamed. The reason for this - my umpteenth - visit to this fell is simple, Chris is closing in on the completion of the Central Fells with only this one left on this ridge, but sometimes nothing is as straight forward as just climbing to the top and this was to be one of those occasions. We could have taken one of the easy routes - there and back - starting from Stockhow Bridge at the south end of Thirlmere and followed the path that runs alongside Wyth Burn and up to Greenup Edge, or from Stonethwaite alongside Greenup Gill, from where a better approach can be made to Ullscarf from the south, but no, he also wanted the surrounding Birkett's thrown in. 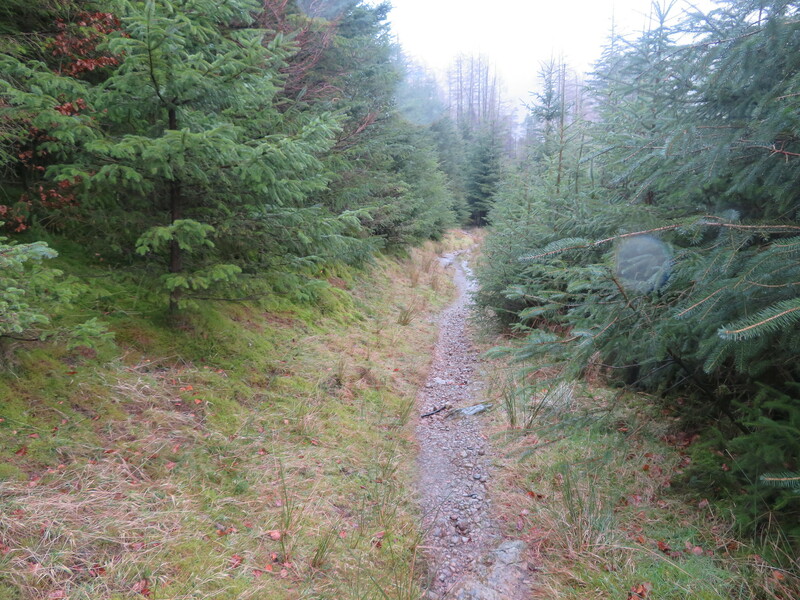 This then meant of course a lot of off piste walking over some rough and very wet ground. 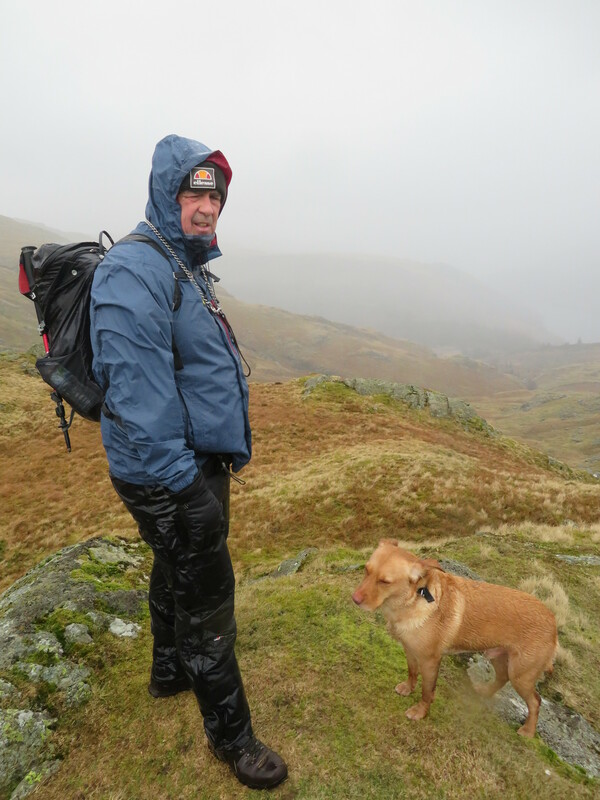 Later on in the walk our amble was further enhanced by high winds and pouring rain. Welcome to Ullscarf. It was a damp start to the day, but dry if you see what I mean. One of those days that looks dry, but also one when one can feel a chilly dampness in the air, a day to be sitting in front of a log fire at the local hostelry instead of tramping across the waterlogged domain of the Central Fells. A dull grey and full low cloud cover base hung over the Eden Valley when Chris arrived with only the lowest slopes of the fells below the Pennine ridge visible, although the weather forecast had promised better conditions from around 9:30am, a promise we hoped would be kept, at least whilst we were out and about on the high fells. 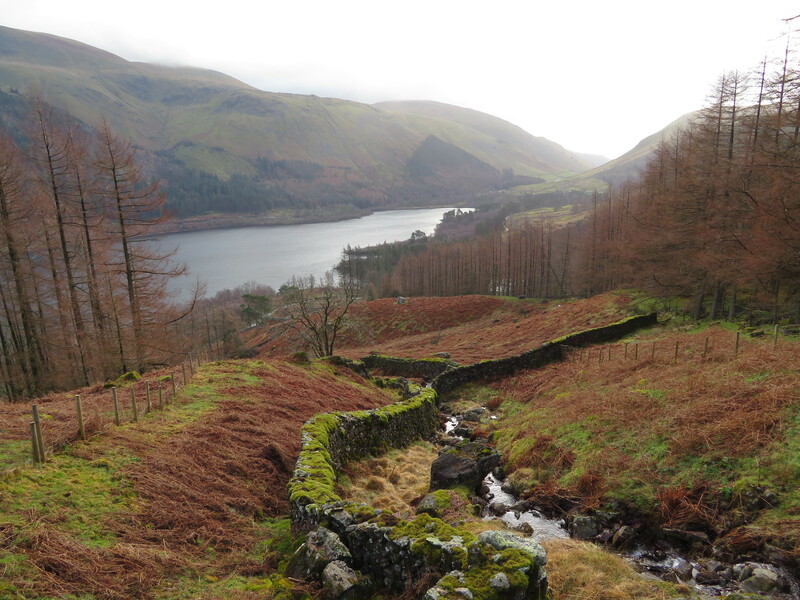 We set off into the gloom of the day making our way to the south end of Thirlmere and Wythburn from where we then followed the road along the west side of the reservoir until we reached Dobgill car park that was in a state of being tarted up. Upon leaving the main A591 at Wythburn we passed numerous road signs telling us that the road was closed but obviously it wasn't and as we had no intention of using the car park anyway we thought that we would drive along until we were stopped either by barriers or forestry workers, we saw neither, only more signs warning that the road was closed, it wasn't. 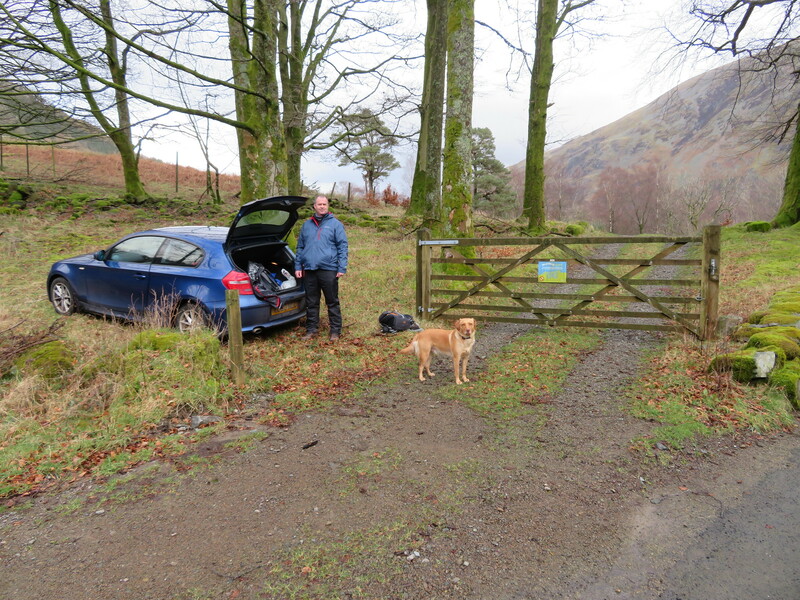 At this point we didn't know that the car park was being refurbished but as we approached Dobgill it was quite obvious what was going on although there were no workmen in evidence nor were there any barriers across the entrance. Nonetheless our planned place of parking was to be just a few metres further along the road by the side of a gate that opens onto a track, the start of our walk. A few small branches had to be cleared - debris from the high winds that we have had recently I suppose - before we could get parked up - NY31628 14118 - whilst just to the side of us there was available space for another two cars after a little housekeeping has been done. 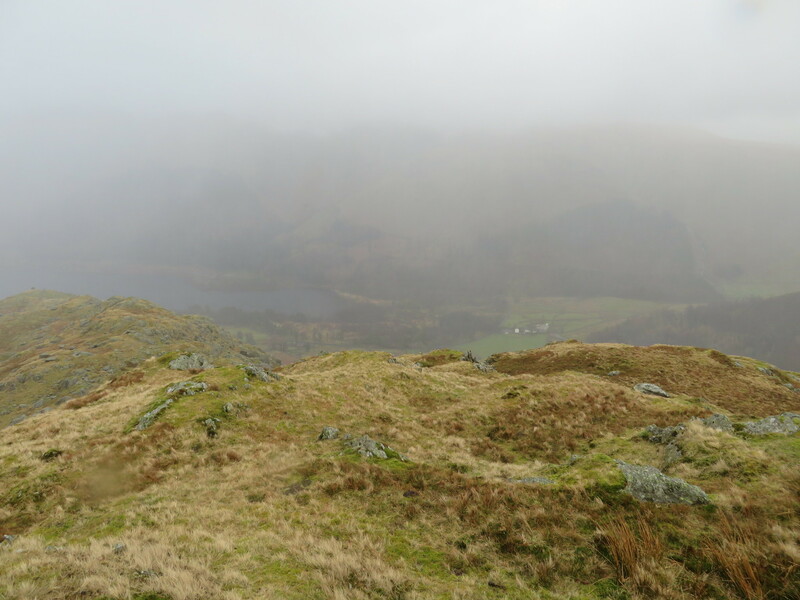 The clouds were still hanging low as we set off along the short track that put us back on the road for a few metres until we reached a double width wooden gate that would put us onto the foot of the fell below Swithin Crag and Bank Crags. 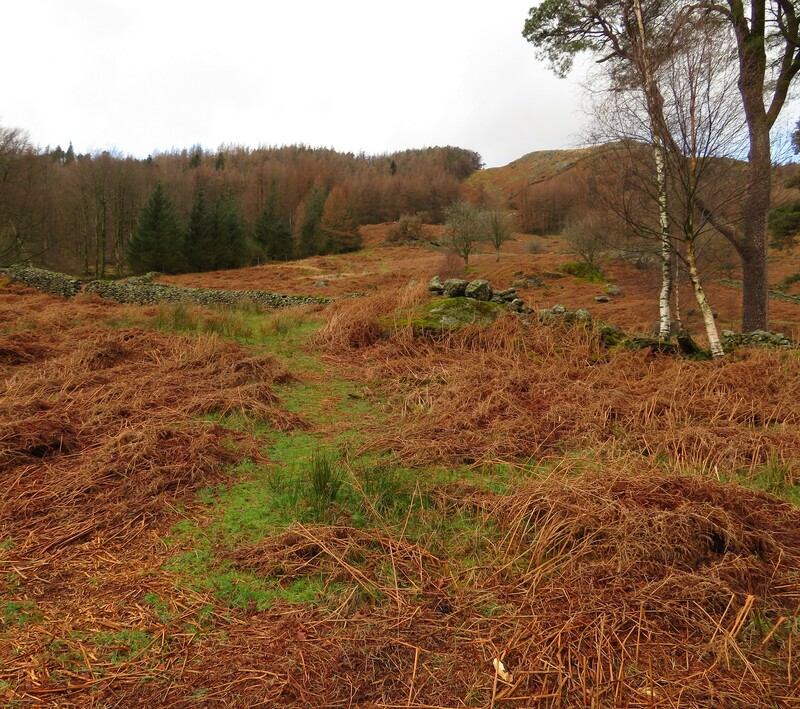 From the gate there is an obvious and green path that we followed through last years bracken, easy at first but getting steeper as we approached the pine plantation on Swithin Crag. 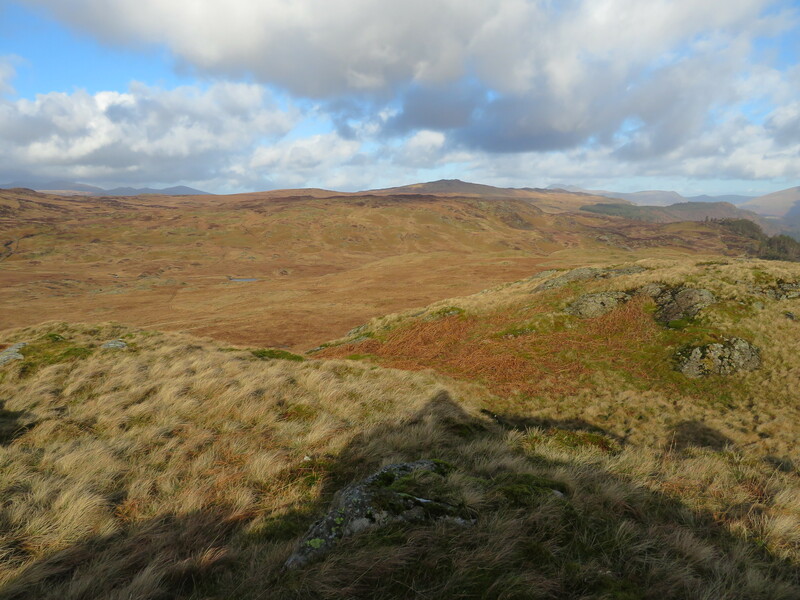 As we climbed steadily up the fellside blue sky made an appearance to the north, it was 9:25am so it looks like the weather forecasters may have got it right. 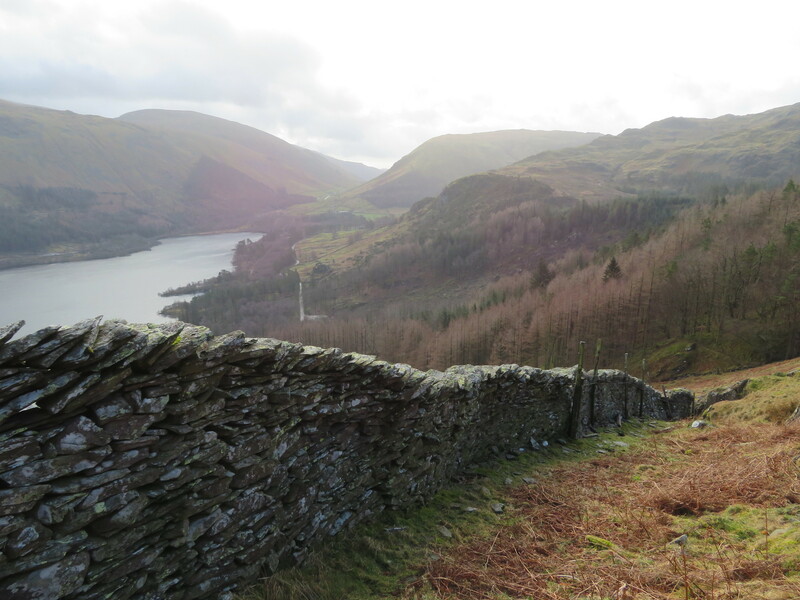 We passed and crossed over some old drystone walls and after a bit more climbing stopped to take a look back to Thirlmere and the lower slopes of the Helvellyn ridge that itself was still covered in clag. A little further along and we came across this iron structure but for what purpose it was meant for I could only guess at either tree protection or as it was sat on a ring of stones maybe it was sat over an old and long filled in well. 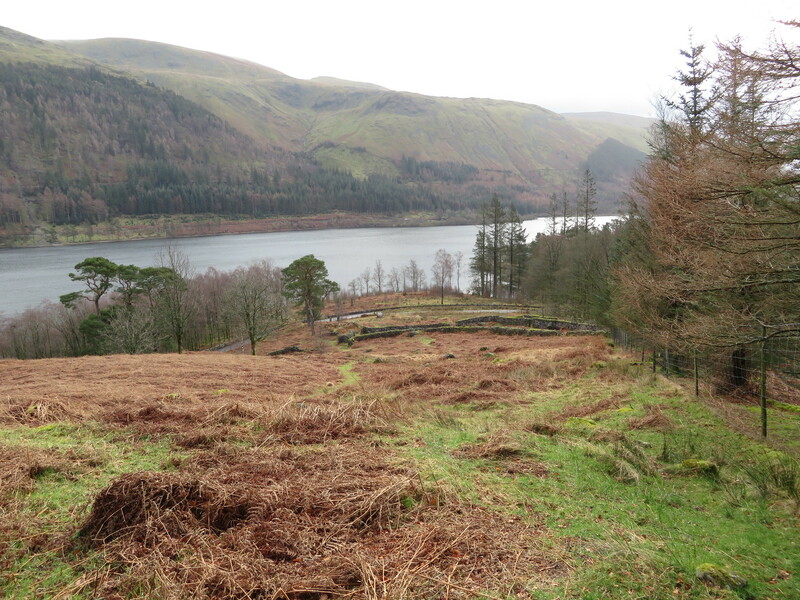 From the iron cage we then continued up alongside the plantation with the path getting a little rougher and steeper as we neared the forestry track that lay just above us and as we reached Cragsteads Gill another glance back gave us a view south along Thirlmere and Wythop. Up to this point the path is steady enough, firm and dry, but as we moved beneath the trees it proved to be more rock and stones than the previous grass and the underfoot conditions were now quite slippery with the wet soil and green algae on the rocks/stones slowing us down somewhat. By this time the sun had made an appearance and as we had on our over trousers and coats we were getting decidedly warm but as there was a bit of a nip in the breeze we stayed as we were knowing that before too long we would be open to more exposure to the elements the higher we climbed over open ground. There was a large 4x4 parked on the forestry track accompanied by a shepherd and his trusty dog and as we approached he asked to stop and put Sonny on his lead whilst he collected and moved on the last of the stragglers from an earlier roundup. Once he had sorted the sheep out he waved us on and upon meeting him found him to be a friendly sort of a bloke with him asking us where we were heading for. 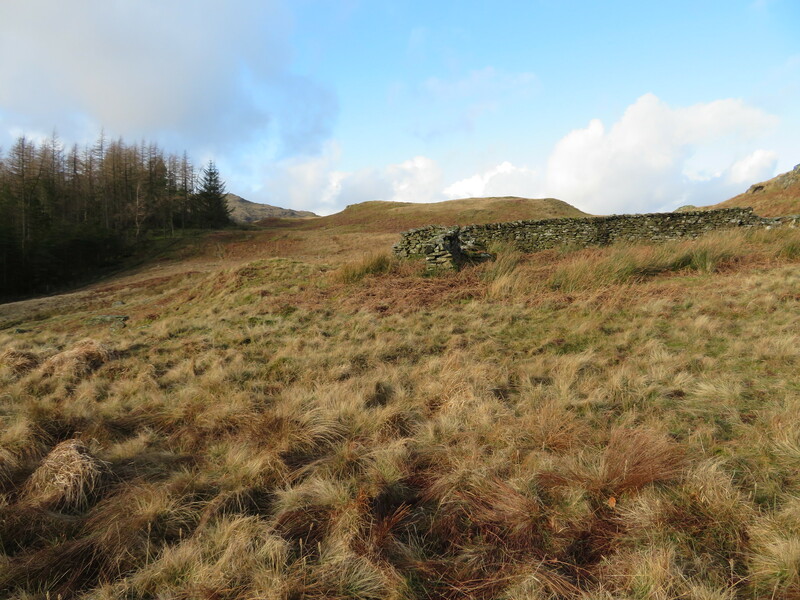 On telling him he mentioned that the area around Bank Crags and Brown Rigg was known locally as City Fell. 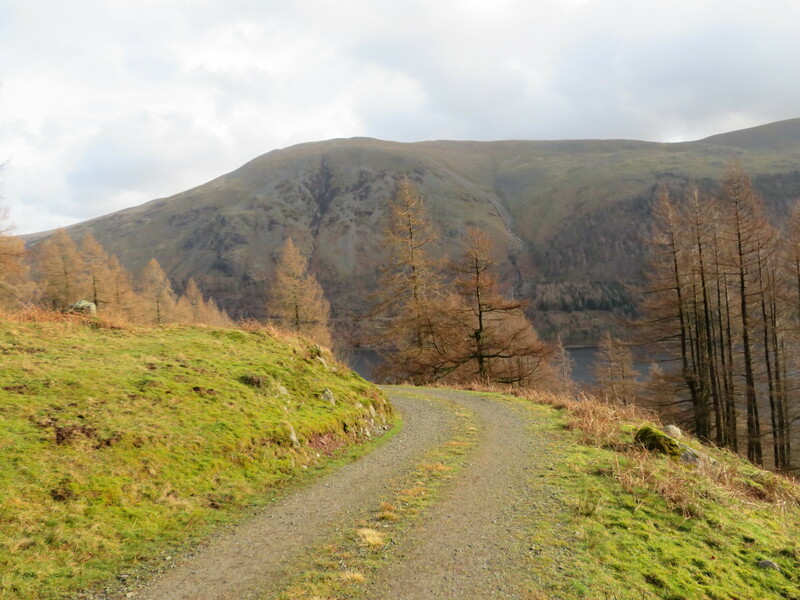 The forest track continues south west towards Harrop Tarn whilst going the other way it comes out on the metalled road around Hause Gill. From the track we had a good view of the Helvellyn Screes. From the track we passed through another gate to now start the climb up the south side of Bank Crags, a climb that is a bit steeper than lower down and it's simply a case of just more or less following the wall with the path now covered in stones that have fallen off the wall with parts of this path proving to be quite slippery in places with the fence topping the wall making an excellent aid in helping us to pull up some of the steeper and more slippery bits. After a few minutes along this path a look back south gave us a good though hazy view across the fells. And swinging around a touch gave us this view. If only the sky was clearer we may have had better views but we had to take what was given today unfortunately, and it was to get much worse before too long. 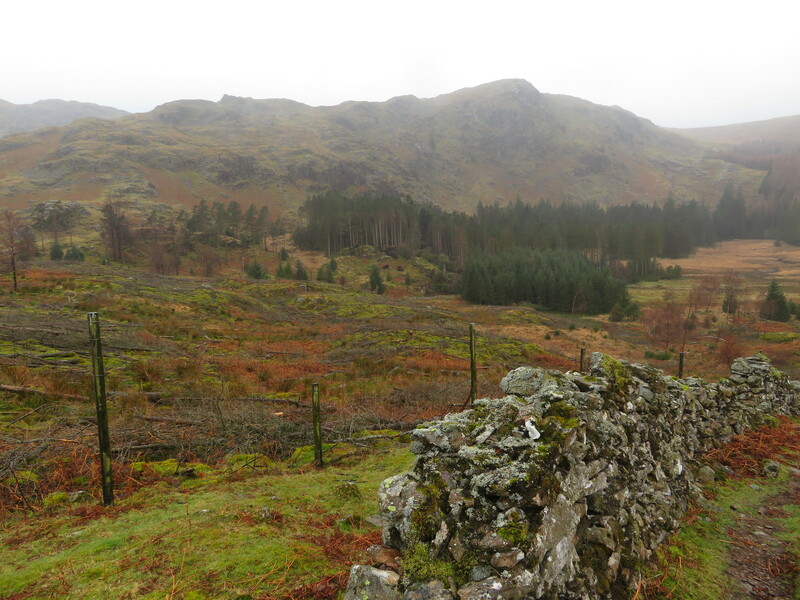 As the path sort of peters out we found an appropriate point where we could turn off to the west to complete the climb onto the top of Bank Crags from where we then continued in the same direction passing some old sheepfolds to our right. From here on it's mostly over pathless ground with just the odd faint sheep or deer trod going roughly our way for a short while but a distinct path there is no sign of at all. 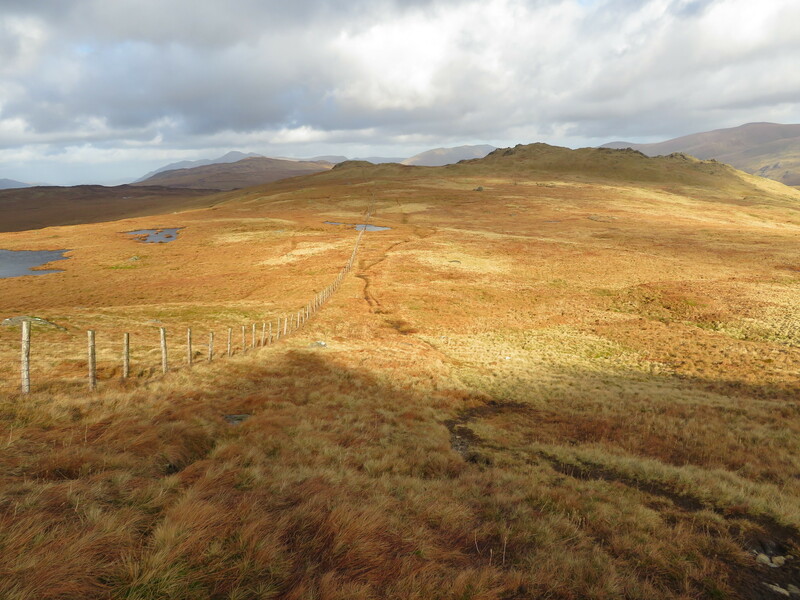 We were now heading west for the 463 metre high Brown Rigg and the cloudy sky was interspersed with patches of blue allowing the sun to isolate small areas with spotlights of bright rays. 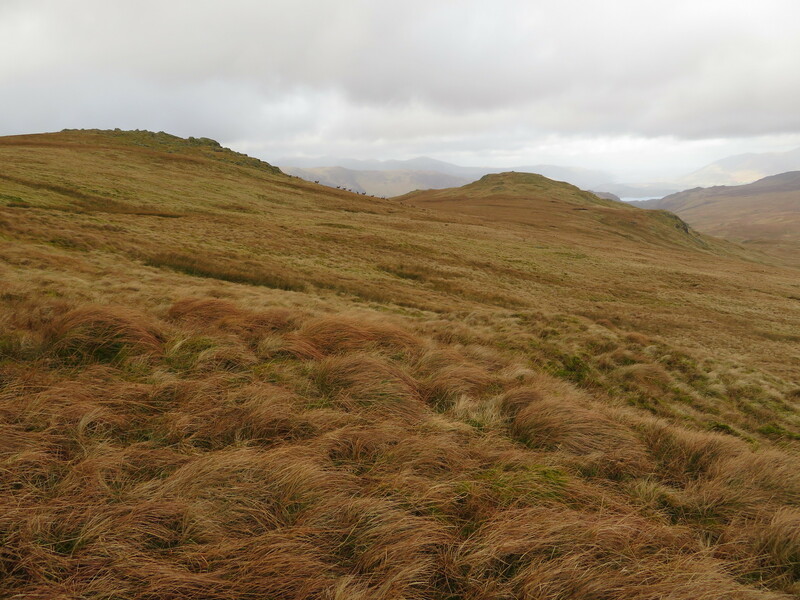 Despite the welcome sight of sunshine, albeit from a distance, there was a cold wind blowing now that did nothing to encourage us to stop and linger as we made our way over rough wet grass and ground. 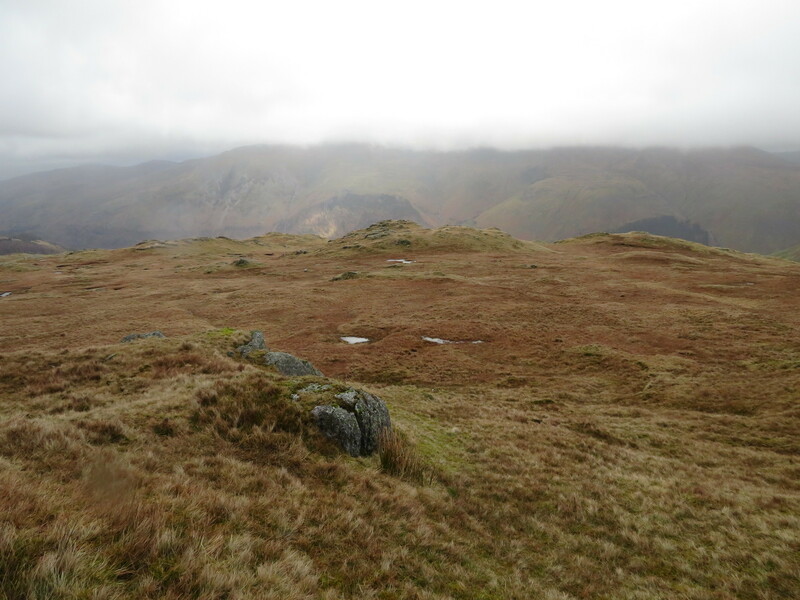 15 minutes of walking saw us arriving at Brown Rigg the first of the seven tops that we had in for today, a top that is a large grassy knoll with plenty of bits of grey rock in evidence with the summit playing host to a large boulder laying at an angle on a sloping bed of rock. Good views are to be had from here with amongst others Blencathra to the north, High Seat, the Helvellyn ridge with its multitude of tops. 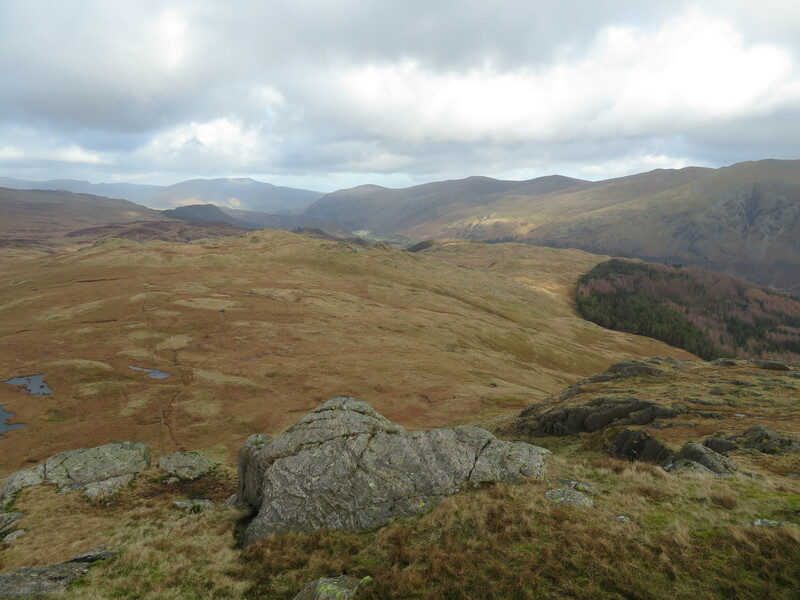 Some of the Dodds, Clough Head, Calfhow Pike etc. 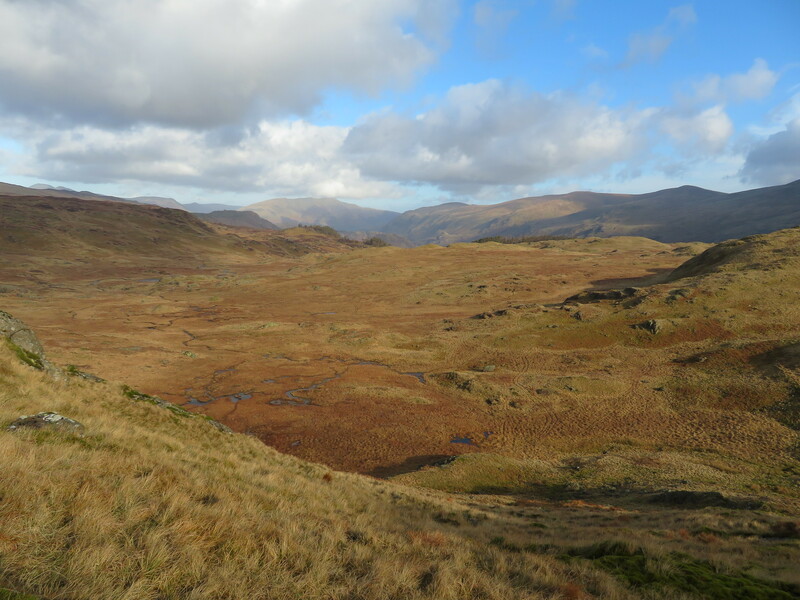 We also had a good view of our next hill that was to be Blea Tarn Fell with Standing Crag and Low Saddle over to the left. The wind was by now increasing in strength and it looked increasingly likely for us to get some rain, lots of rain. Leaving Brown Rigg to the wind we struck off to the southwest keeping to higher ground as to the right there is the hollow and drainage area that feeds Launchy Tarn and Launchy Gill a place that itself is fed by the water that drains off from Long Moss that sits behind Bell Crags an area that was also known for its quarrying activities and where a few ruins of buildings are to be found. 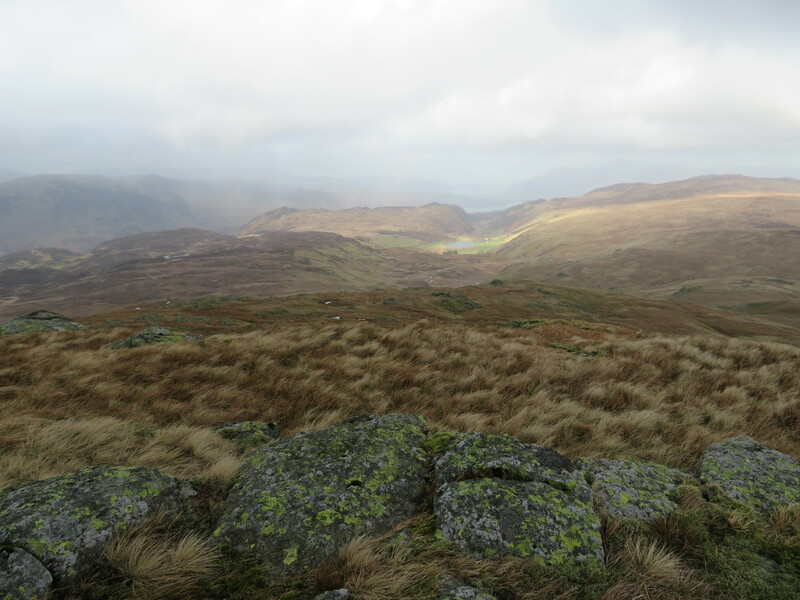 From the lower slopes of Blea Tarn Fell I took this photo across the Moss. 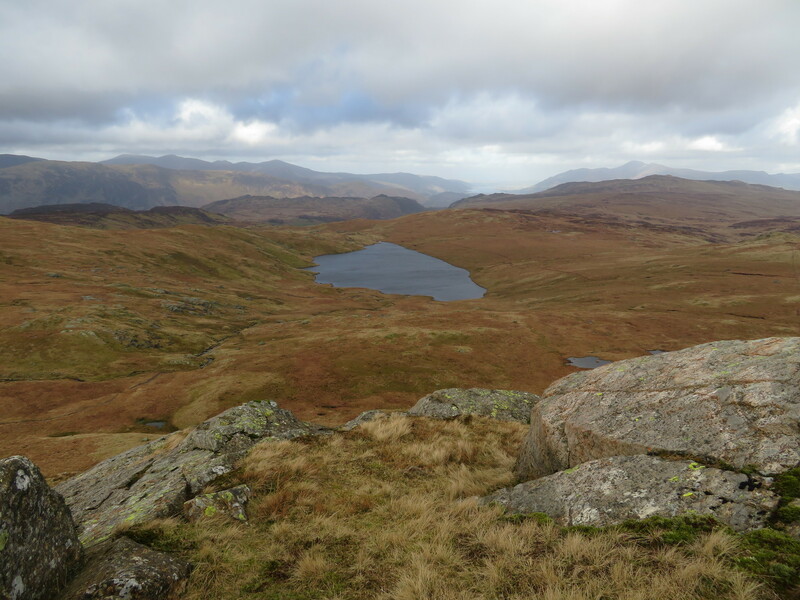 We descended about 50 metres following a path that had mysteriously appeared before us to circle around to Stone Hause from where we were once again pathless and finding the best way we could through the numerous rocky outcrops to climb the 145 metres required to reach the summit of Blea Tarn Fell. At 558 metres this is a big hill and wide open to the weather. By now the wind was very strong and once on the top of this fell we could hardly stand up and I was fortunate to grab a couple of half decent photos before taking the exit stage right option. As can be seen by the next photo the weather was such that Chris had almost everything that he had with him on. No rain just yet, but note the wetness of the boots, and we haven't walked all that far yet. 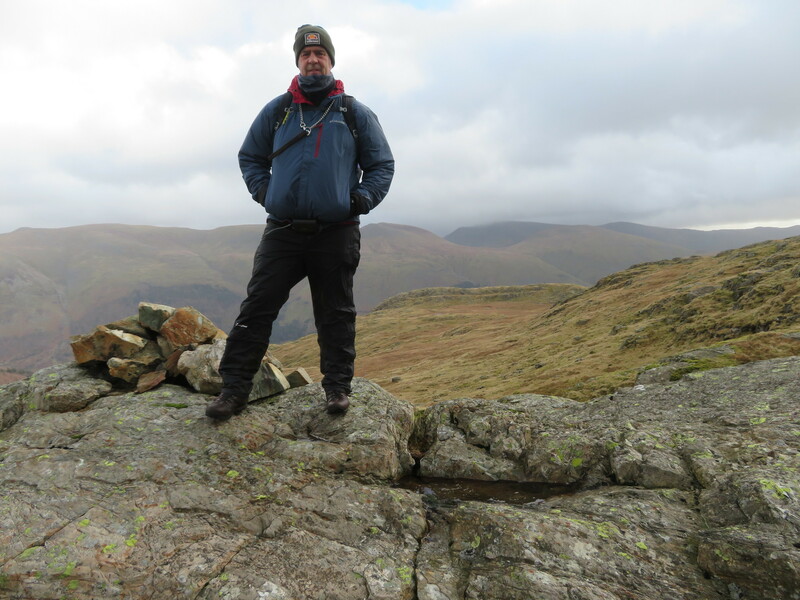 In the background there is Ullscarf centre with Standing Crag behind the left shoulder of Chris and the two small humps to the right are Low Saddle and High Saddle on Coldbarrow Fell all four of which are on today's route. We left this top by dropping off the south slopes then taking a short dogleg to the southwest before picking up a good but very wet path running directly south that just about keeps us on the highest available ground with the drainage area of Blea Tarn to our right and Harrop Tarns to our left sitting below Tarn Crags. 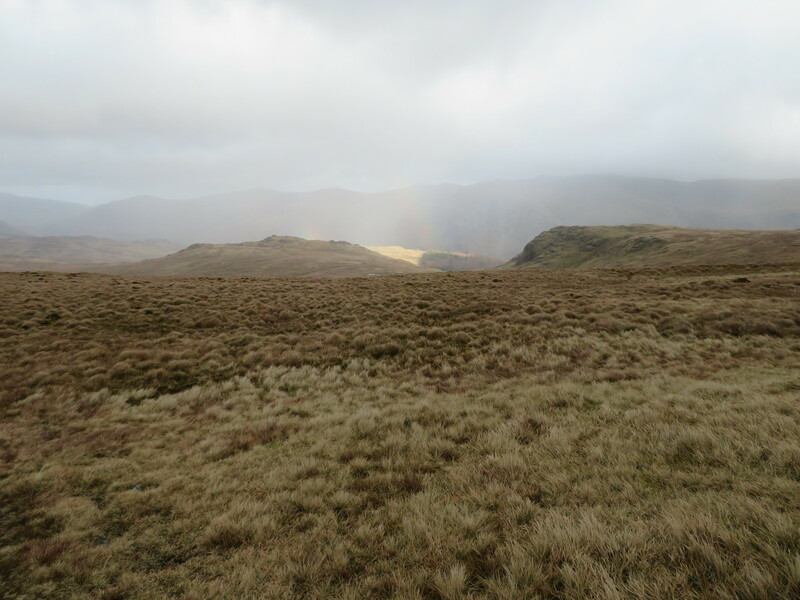 Another 15 minutes of walking over wet ground found us at the gate at the foot of Standing Crag's lower slopes to find that the sun had been chasing us but unfortunately not fast enough to warm us with its golden rays. This is crazy, roiling clouds and strong winds with glorious patches of golden sunlight scattered about at random and forever changing as the wind dictates the path of the clouds with first this and then that area enjoying a touch of spring. 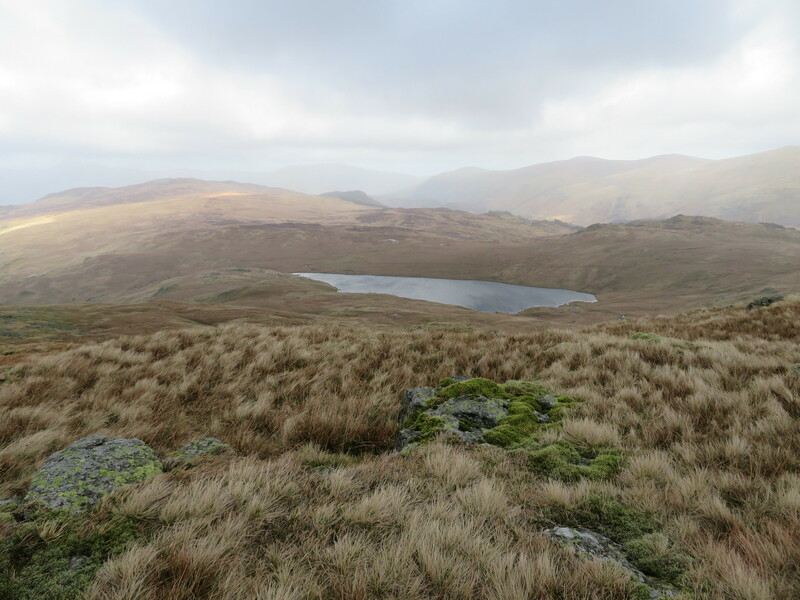 There are quite a few tarns around this area and those that were blessed with sunlight were like silver discs lying amongst the brown fell grass whilst those in the shadow of the cloud looked dark and ominous, unwelcoming and fit only for a horror film. and then across to Clough Head etc. And of course the usual pose from Chris. Before we left I also managed to get a shot of our next two Birkett's that from this point appear to be miles away. when the rain that was in no way invited began its horizontal attack on our bodies and senses feeling like needles of ice as they hit any unprotected skin, and they hurt like hell. I saw Chris looking towards these next Birkett's with some trepidation and asked him if he was up to going across to them and although he admitted that he was tired he wanted to press on as we were almost halfway around anyway so there was no advantage in going back the way we had come, apart from it being mostly downhill all the way back. So we continued on. We hadn't had a break yet neither as the weather, with no suitable shelter from it, wouldn't allow such a luxury just yet so around 20 minutes of walking from Standing Crag found us at the 650 metre contour that would allow us to climb the fence and maintain height as we made our way around the head of the Blea Tarn feeders to a point just north of the foot of High Saddle. 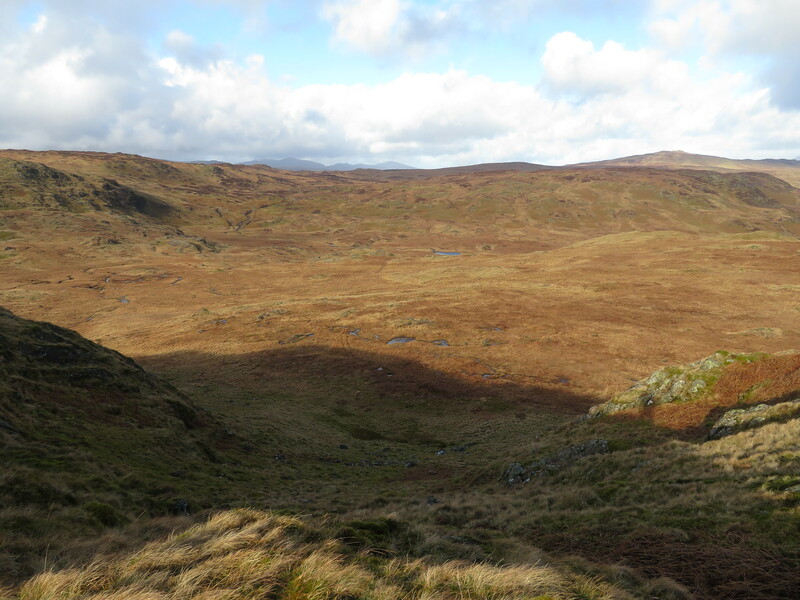 It was on our approach to that point when we saw a herd of deer, a fine sight of some beautiful animals, a mixture of ages with one large stag overlooking them from higher ground. It didn't take them long to spot us and they held their ground as we were still quite a way off them but as we neared they got nervous and started to move away down the fell towards Blea Tarn. Chris counted 27 as they made their way to quieter ground, a beautiful and wonderful sight. 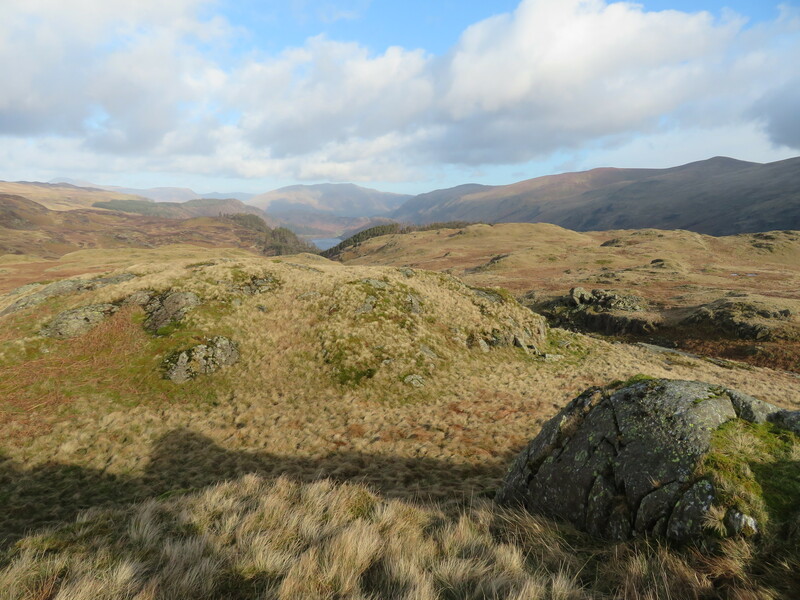 This was just another wonder of the fells to be seen in the less frequently walked areas of the LD. 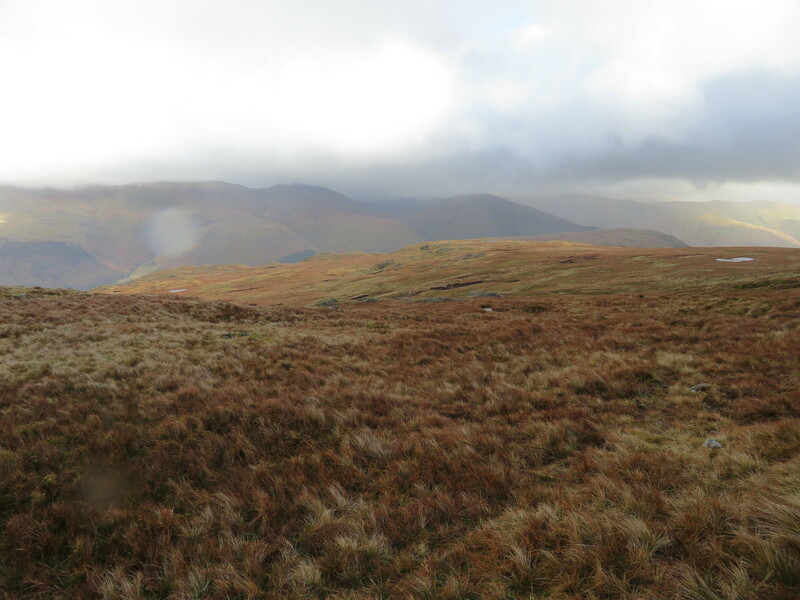 and it was nearly hands and knees across this stretch of fellside with the Helvellyn ridge covered in a light haze of cloud and rain, but at least we had a rainbow to help make light of the dire conditions. 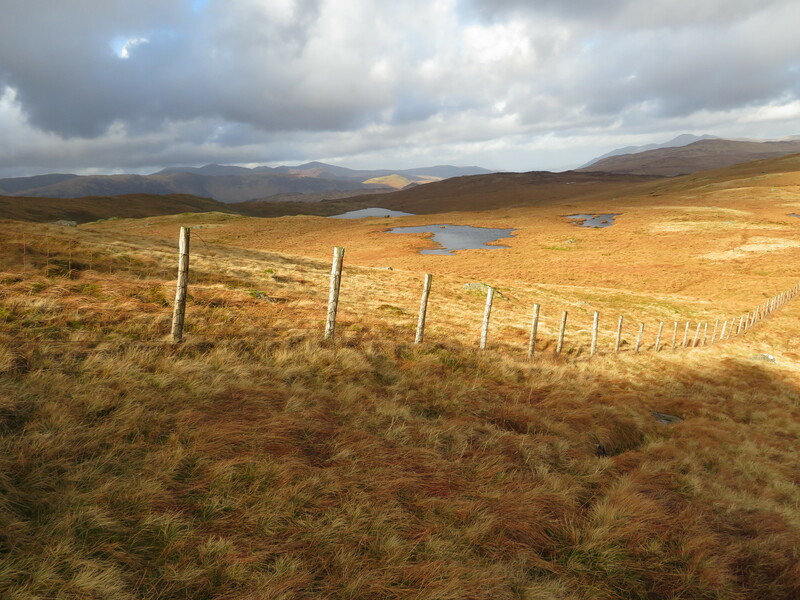 with a northern view towards High Seat and Watendlath, the latter bathed in sunlight with the tarn and surrounding green picked out beautifully amongst the brown of the surrounding fells. Over to the west we could see the hills of the Newlands Round, King's How, Grange Fell, the bumps of Joppelty How, Great Crag and many more could be picked out from this summit, just a shame about the weather. 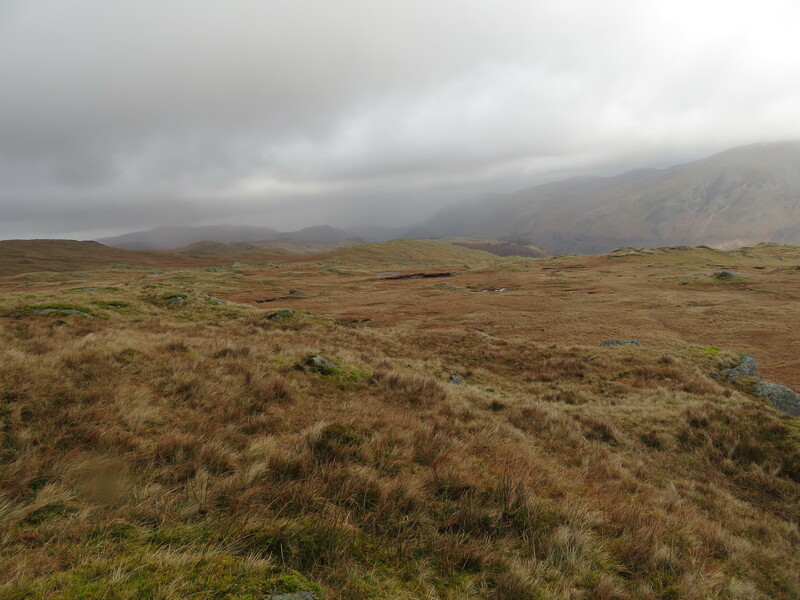 We had to make another early exit from this wide open fell as driving rain and strong winds were playing havoc with our bodies. Retracing our way to here we struggled back to now claim High Saddle at 675 metres, a place that we just passed over as a photo shoot was nigh impossible in this weather. 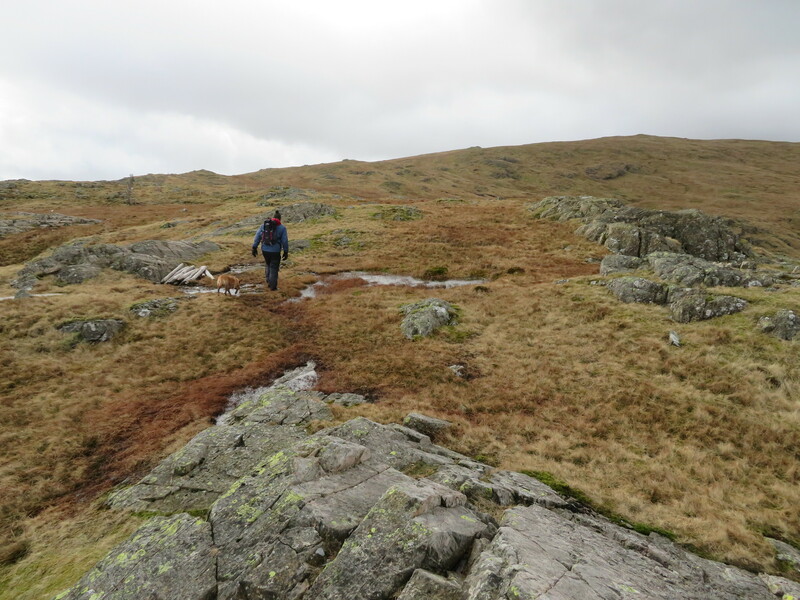 A glance back and we saw two other walkers on top of Low Saddle but they soon disappeared out of sight as they immediately descended down towards Blea Tarn. It was now just a case of one foot in front of the other as we climbed up the normally easy slopes as we fought the wind that was making us stagger about like two drunken men and it would be 35 minutes of hard going after leaving Low Saddle to attain Ullscarf summit. 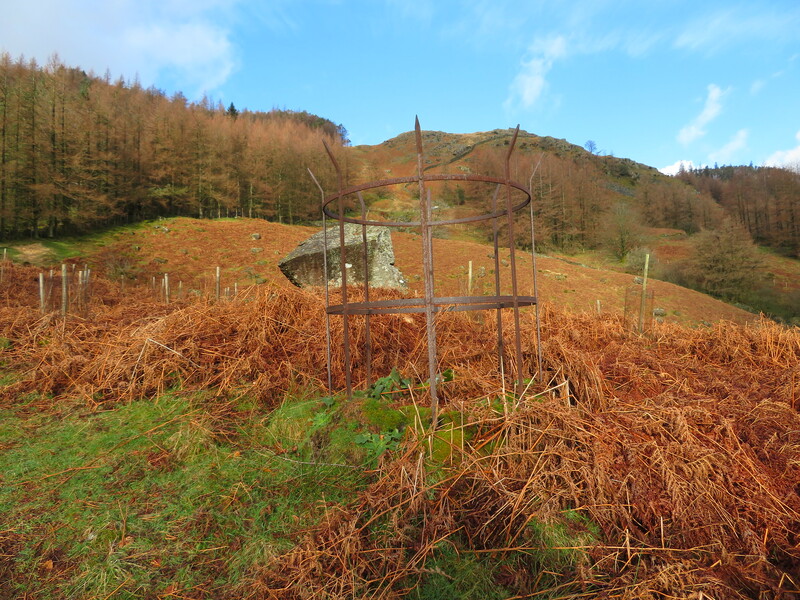 The cairn has changed over the past 4 years, some of the iron bars - old fence posts - have been removed, but why? Where are they? They were nowhere in sight, maybe someone took them as a souvenir of their visit here. 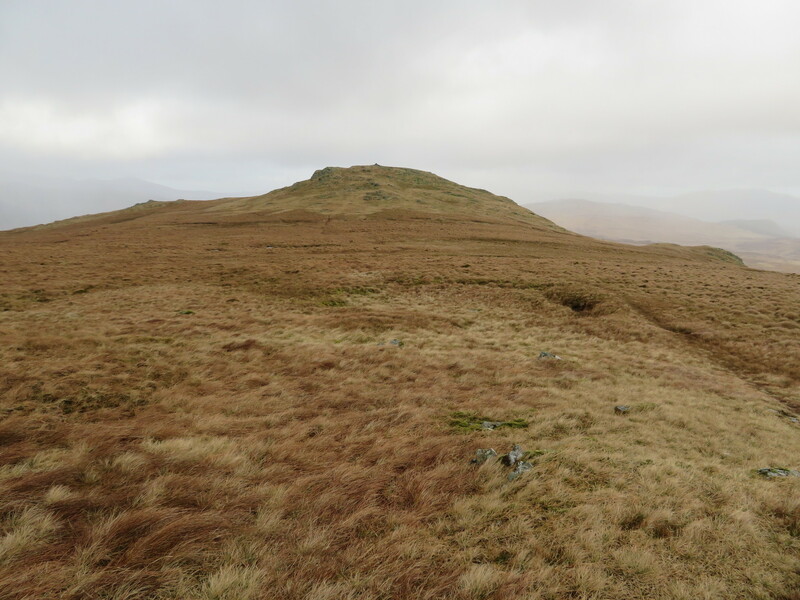 One more Birkett left, Wythburn Fell way down the fellside that now entailed a long walk over rough ground in a roughly easterly direction, but at least it's downhill and we would hopefully be leaving the worst of the wind behind, though unfortunately, not the rain. Off we went initially following a well worn path for a few metres but soon had to leave it as it was going in the wrong direction to where we needed to be. Our line of descent would take us over the rock scattered area of Black Knott taking the easiest line possible avoiding any peat hags, pools, and holes in the ground. Looking over to the hills around Grasmere anyone over in that neck of the woods was fairing better than us as they were bathed in sunlight whilst the Helvellyn mob was blanketed in cloud. It was an hour before we reached Wythburn Fell due to a combination of bad weather and rough ground, but at least the wind - although still blowing - was now greatly reduced in force apart from the sudden strong gusts that it threw at us and the rain was now falling steadily instead of hurtling at us from the side. 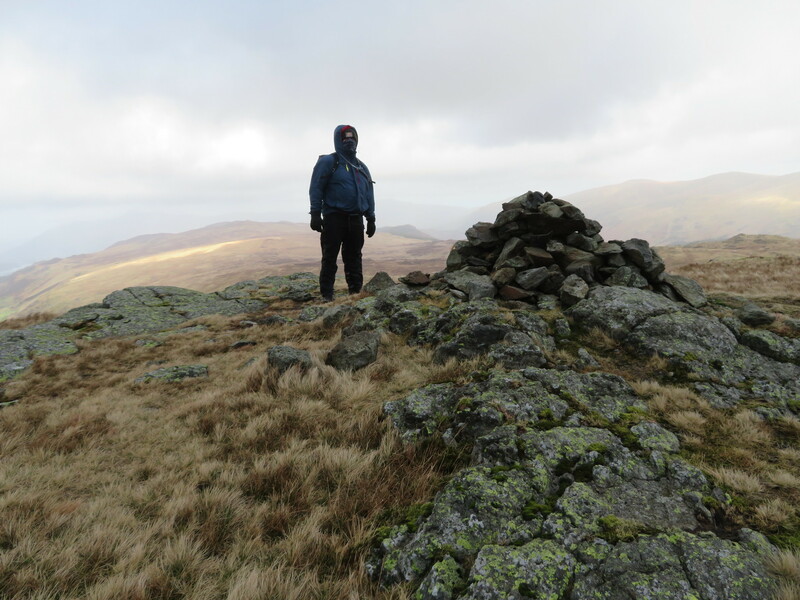 Wythburn Fell is nothing more than another grass covered rocky hump on the fellside standing at 508 metres and we had just passed over a 515 metre high unnamed top a few metres south of the Birkett. 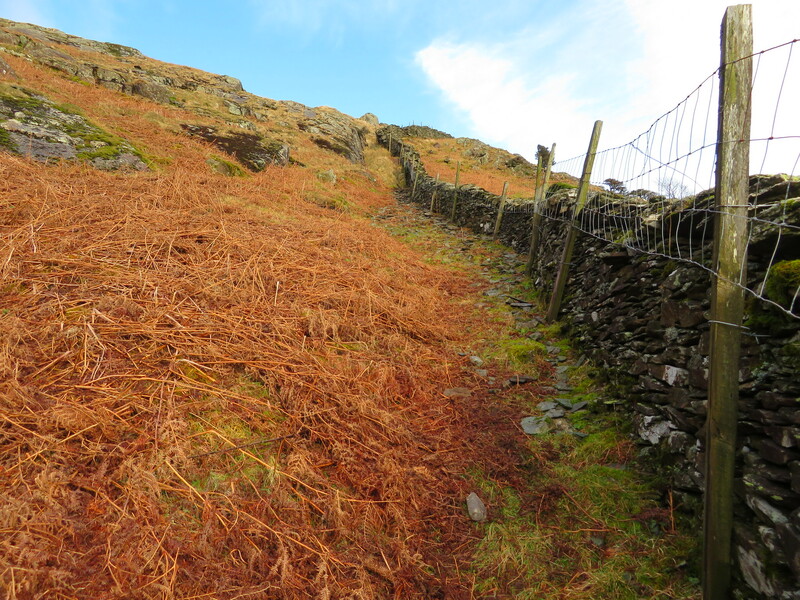 still over the rough for a while until we managed to pick up the path that starts at the bend of Ullscarf Gill but where we met it just below the Beacon, a rocky knoll that has a short length of wall on its top that gives the effect of it being a currick. The descent from this top was a bit steeper than the ground we walked to get here and quite a bit of meandering was done to work our way through and down between the numerous rocky knolls and crags but soon enough we reached the path from where our pace picked up a tad with the easier walking on the good path. 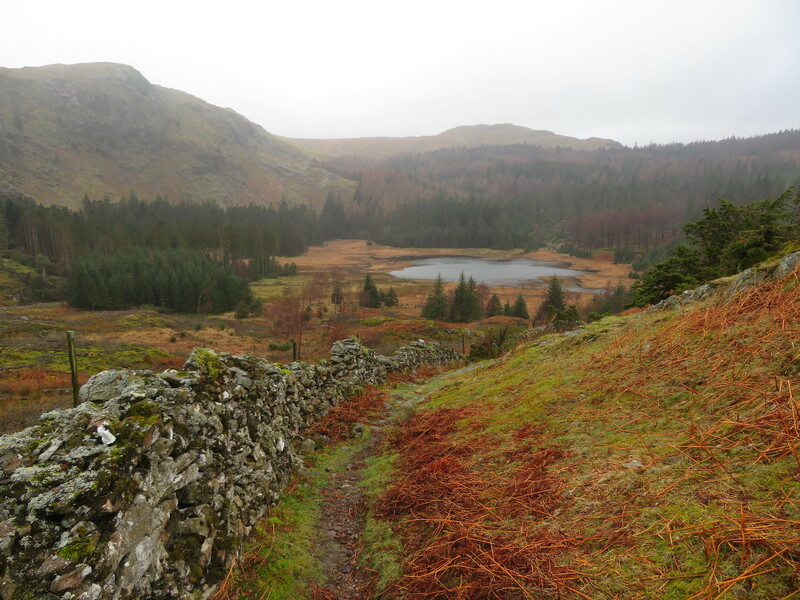 Before too long we had Harrop Tarn and its protecting crag well within our sights as we followed the wall down to the deer fence gate. All we had to do now was cross over Dob Gill via the footbridge giving the large stepping stones a miss this time around, turn left off the bridge to then follow the path back through the plantation. This path starts off amiable enough but as it begins its descent it steepens considerably and consists of pitched stone all sloping downhill, stone paving that was covered in wet leaves and green algae so not a good combination for a wet day. Due to these conditions it was a rather steady walk down to try and avoid any undue harm to ourselves but we finally reached the car park unscathed. We met a family of four just leaving the car park to climb up to the tarn, Mum, Dad, and two small children all inappropriately dressed for a walk up the fell on a day such as this was. We did have a word with them but they continued on anyway. A few more metres saw us back at the car where Chris pronounced that the inside of his boots were soaked as for some reason he had put on an older pair of boots for this walk. Mine were dry and fortunately we have both invested in Sealskinz socks that are guaranteed waterproof and so far have not let us down. Although Chris's boots were full of water his feet were bone dry so well worth the money spent on these socks. They are also warm and have a rubber seal at the leg end sealing them completely from the ingress of water so handy for wading through water whenever the moment arises. 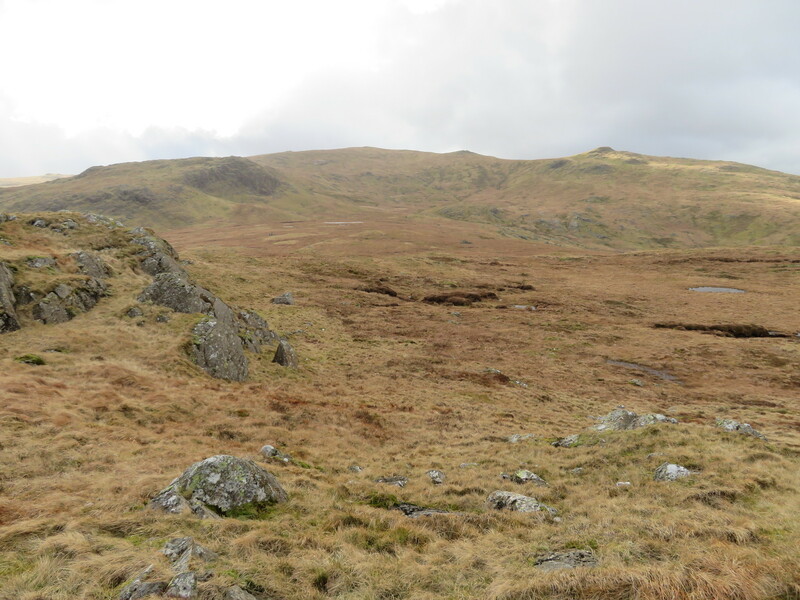 I last walked this route in March - or very similar - 4 years ago in dry but cold and foggy conditions and couldn't envisage me having another go at it, until Chris decided that he wanted to complete the Birkett's as well as the Wainwright's, Lakeland Hewitt's and Nuttall's. He's already well on his way with all of them as he's traipsed along with me on quite a lot of them in the past. This wasn't an ideal day for a lot of 'off piste' walking but it's done now - again - and to be fair we have had some cracking walking days so far this year so I'll keep the grumbling to one side for this one. 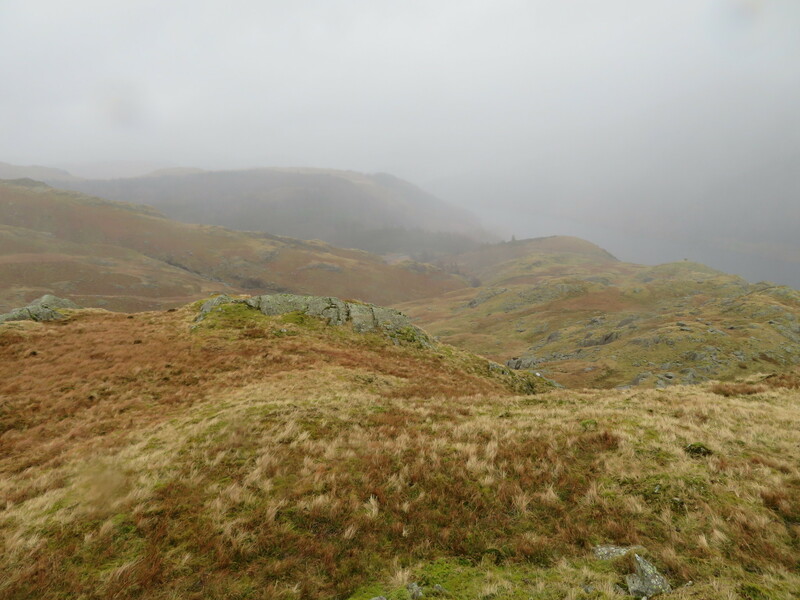 We had done this walk with no stops for food nor drink as the weather was too rough as we got into the higher fells so it was happy stomachs when we did finally refuel whilst sat in the car before leaving the fells behind and finding a place of fine ales and warm fires. 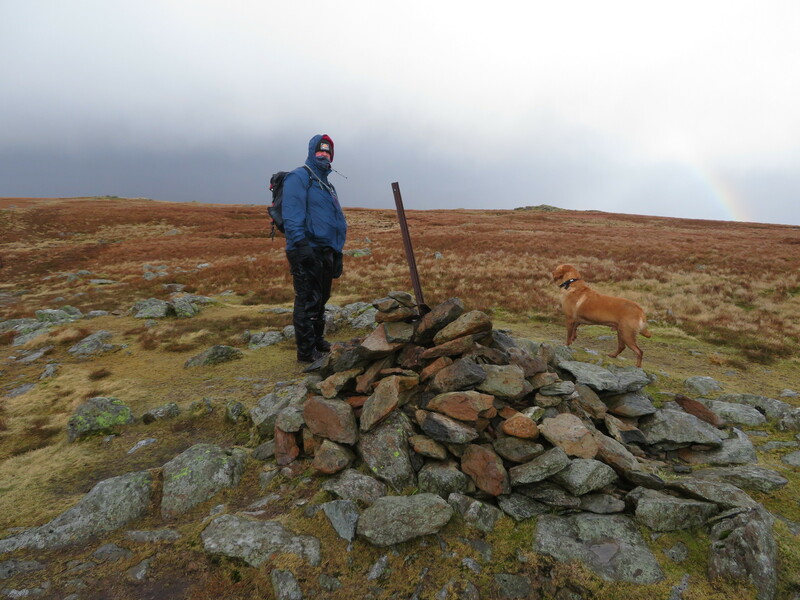 At last, the completion of the Coledale Round. 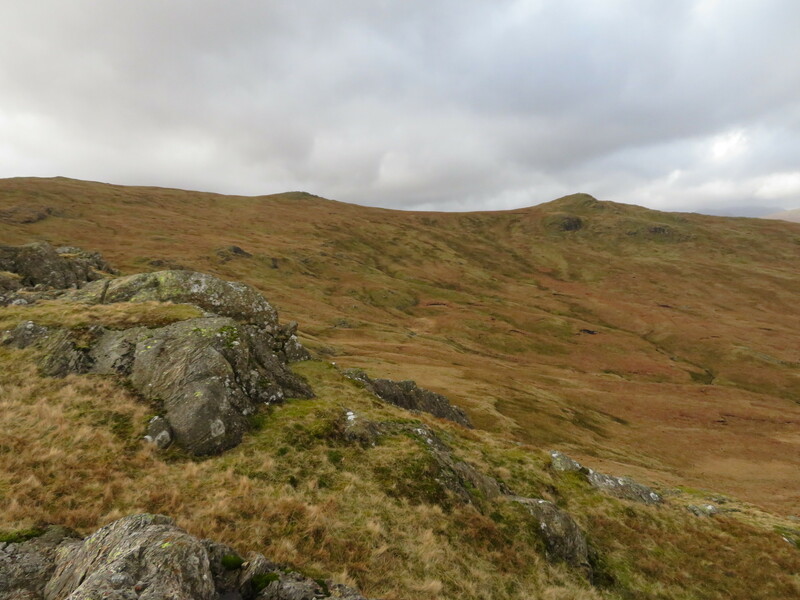 A long,steep,steady climb to some Central Fells. SmugMug/Flickr bandits - go Pro or lose your images. 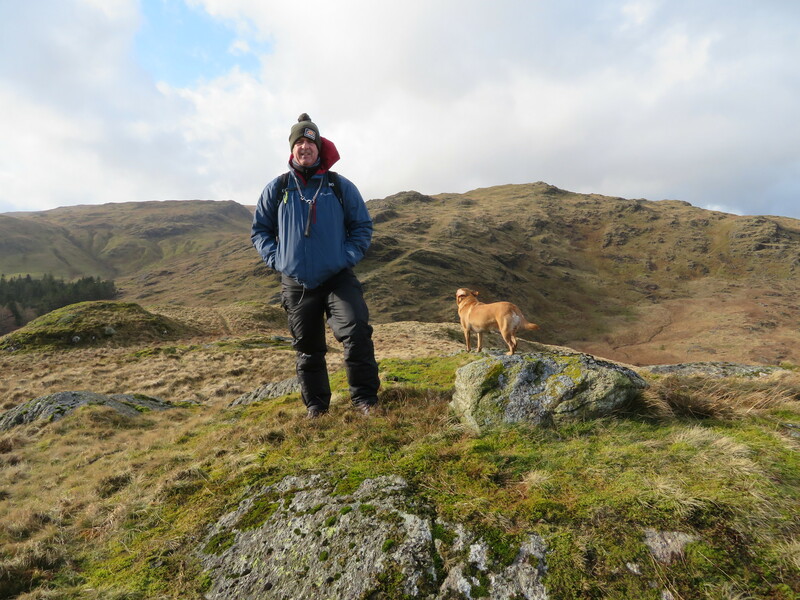 Wansfell, a slow walk back to health and fitness for Chris. 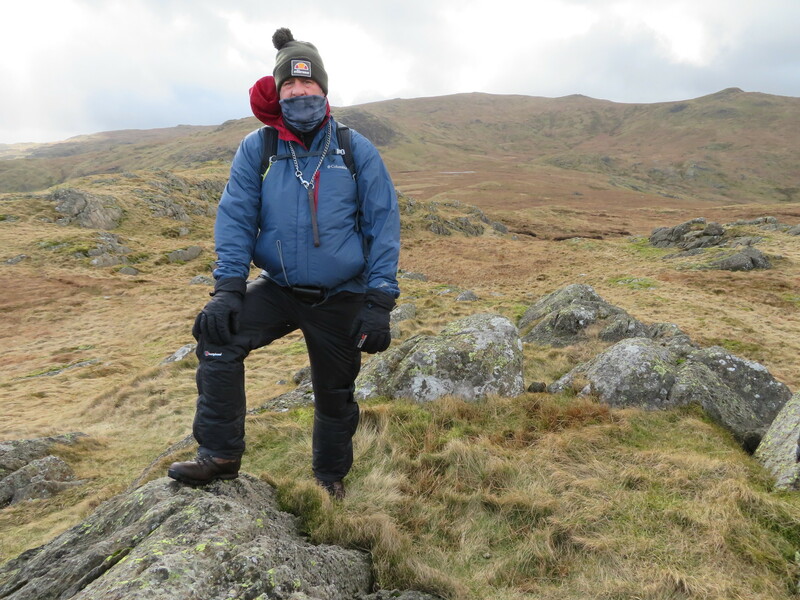 I'm glad it was freezing on Beda Fell. 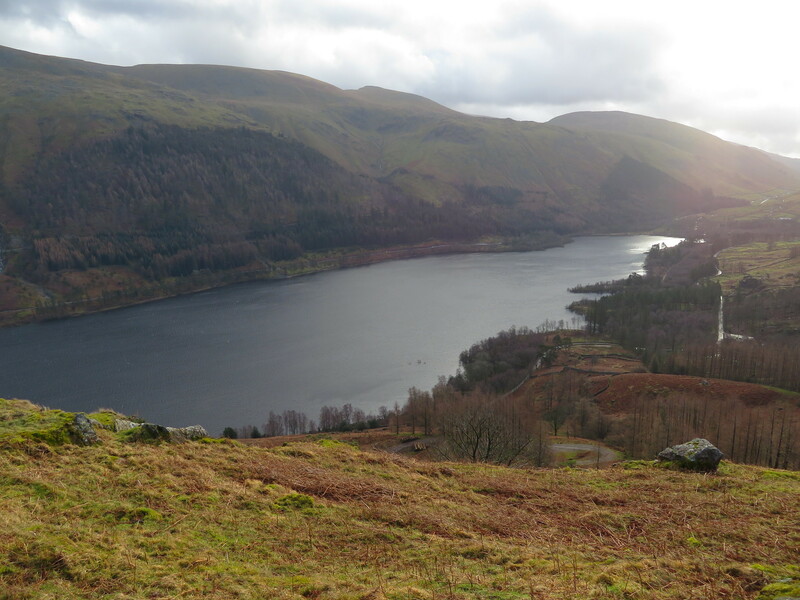 A walk to England's newest mountain-Little Lingy Hill. Tracing the walk of the dead-Shap Abbey to Selside circular. 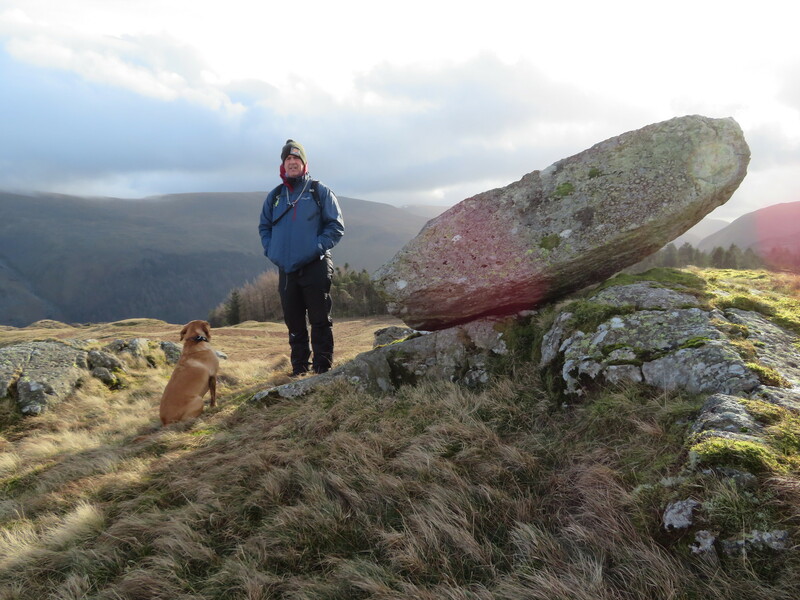 Skiddaw and Bakestall via Longside Edge and Carl Side. 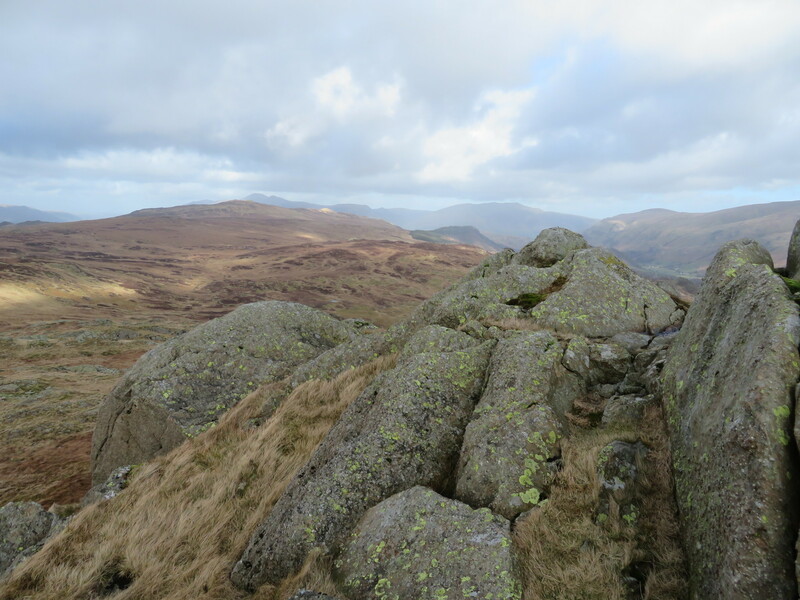 Ideal day out: A good mixed walk with scrambling leading to a good ridge walk.